The Djinn is back, granting wishes to Illinois university students. The crassness of the Hollywood sequel machine is quite astonishing. It’s not surprising that when you make sequels without any of the key cast or crew members of a well-received original, and hand them to directors with no perceptible vision for the franchise, and even less apparent flair for the genre, that you’re going to end up with a film that will appeal only to a tiny number of optimistic die-hard fans, and one that’s unlikely to satisfy even them. This time the Djinn (no longer played by Andrew Divoff, is sporting a goofy new look, in the few scenes where he’s not in human form). 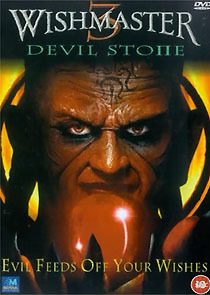 Here’s a good barometer for the quality of the movie: the film is also known as Wishmaster 3 – Beyond the Gates of Hell and Wishmaster 3 – Sword of Justice. Here it’s subtitled Devilstone on the credits and on the trailer, but this appears as Devil Stone on the packaging. Not exactly inspiring. The American disc features a commentary track and a short featurette that aren’t included on Mosaic’s UK version. Their disc includes only the trailer, a tiny photo gallery and some cursory production notes, but it does boast an uncharacteristically decent 1.78:1 anamorphic transfer, and the same vanilla 2.0 audio mix (at 192kbps) as the Region 1 disc. The Djinn will apparently be returning in Wishmaster 4: The Prophecy Fulfilled. I kid you not.